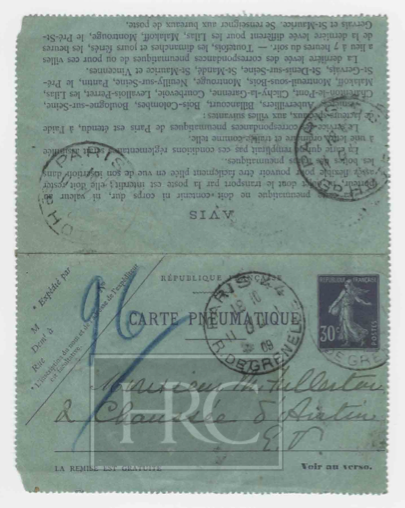 How Edith Wharton’s Letters Flew! We e-mail. We tweet. We text. Our messages are virtually instantaneous. But we aren’t the first to invent quick messaging. 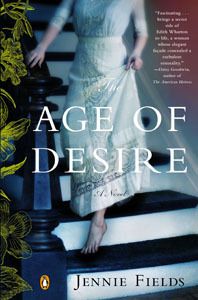 If you read my new novel, The Age of Desire, you’ll find out that back in Paris at the turn of the century, Edith Wharton stayed in contact with her lover, Morton Fullerton with what she called “petit bleus,” little notes of blue tissue paper which she then posted through the wondrous pneumatic mail system of Paris. Those little blue notes were shot through pneumatic tubes to a telegraph office in Fullerton’s neighborhood, then delivered to him by bicycle messenger. Crossing Paris at what was then an extraordinary 50 km per hour (31 miles per hour and of course, with no traffic!) they allowed Edith’s morning notes to reach Fullerton’s area in minutes and he answered sometimes, even before lunch. Begun in the 1860’s, surprisingly, this system remained in Paris all the way up to 1984, long after telephones were ubiquitous. We think our culture invented speedy communication. Ah, but the French had it in hand a century ago! Screened Porch Bliss Meet Me at The Mount!